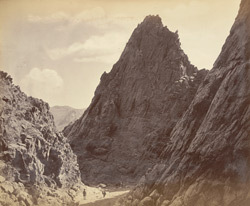 Photograph with a view of the sharp-peaked walls of the Lataband Pass in the Karkacha hills between Seh Baba and Butkhak in Afghanistan, taken by John Burke, 1879-80. A military post was established at this point by the British during the Second Afghan War (1878-80), which was held by Colonel Hudson while Afghan forces held the nearby post of Sherpur. Hudson’s forces were surrounded but could communicate by heliograph in clear weather (an apparatus which used a movable mirror to reflect sunlight to signal to distant points). Colonel Hudson’s force at Lataband, together with troops stationed at the garrison at Jagdalak near the pass, fought against the Tezin Ghilzais who occupied the surrounding hills and eventually drove them off. It is part of a series of images forming the Afghan War albums which provided a visual document of the country and resulted in Burke achieving renown as the first significant photographer of Afghanistan and its people. The British became involved in Afghanistan, trying to create a buffer state and protect their Indian empire in the face of Russian expansion in Central Asia. The Anglo-Russian territorial rivalry created what came to be known as the Great Game between the powers. In 1878 Burke accompanied British forces into Afghanistan, despite being rejected for the role of official photographer. He financed his trip by advance sales of his photographs 'illustrating the advance from Attock to Jellalabad'. In his two-year expedition in Afghanistan during the Second Afghan War, Burke became the photographer of the region where the strategies of the Great Game were played out. In a latter phase of the war, from October 1879 to the summer of 1880, British troops (the Kabul Field Force) under General Roberts occupied Kabul. Burke stayed here for too for many months, photographing the city and its inhabitants. It is obvious from his varied images that he had a close relationship with the British troops and did not hesitate to be part of the frontline of action.